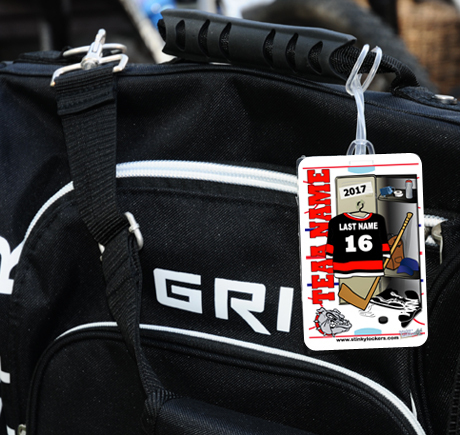 Personalized Tag for your Hockey Bag. An ideal team or player gift! These PVC tags are two-sided with full color on both sides and come complete with 6" loop to attach to any bag, suitcase, garment bag, stick bag, backpack or sling bag. We will customize the locker scene to feature your team name and we will change the jersey color to reflect your team's colors. We will also customize the jersey with your player's last name and number. Upload your logo and we'll feature your logo in the lower left hand corner of the bag tag! Looking to order for an entire tournament? Email us for a tournament quote. Order 100 or more for only $ 3.95 each. These tags are high quality. They were easy to design, are sturdy, and the graphics are amazing. Would highly recommend! Product is great quality. The logo came out awesome. Colours are great as well. Shipping was fast. I just received my bag tag in the mail today and it is perfect! I will be using this web site to order many more products when needed!